Ciabatta is Italian for slipper. This is fitting since the finished loaf is somewhat slipper shaped. This is a very spongy, airy bread that has a crisp crust. It is great for making sandwiches or just served warm with butter or some other spread. Its very mild flavor is what makes it such a great bread for playing "container" to other ingredients. Ciabatta is believed to have first been crafted in the Lake Como region of Italy. It was first introduced in the United Kingdom in 1985 by Marks and Spencer, a department store. 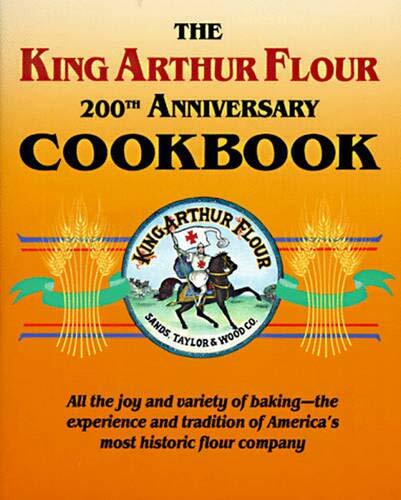 It made its way to the United States when Orlando Bakery, a Cleveland firm, introduced in in 1987. 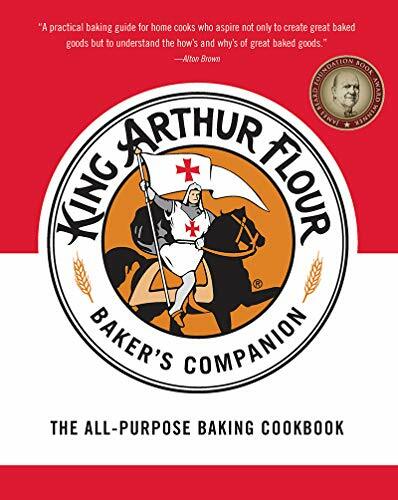 To accomplish this introduction Orlando Bakery hired three Italian bread makers to develop the American version. Within five years ciabatta could be found all over the United States. Ciabatta dough is very wet and this requires the use of a stand mixer and dough hook. It is simply too wet to work by hand. 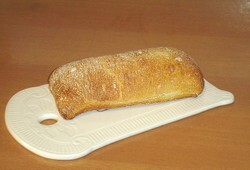 Ciabatta also requires a "starter dough." This starter dough is called "sponge" and it is the primary reason Ciabatta has the flavor and texture it is so well known for. For this reason the recipe will be a little more complicated than standard bread or the rustic boule recipe I posted earlier. This recipe will take fourteen hours to make. Twelve of those hours will be for the "sponge" dough to develop at room temperature. You should use unbleached or white flour. 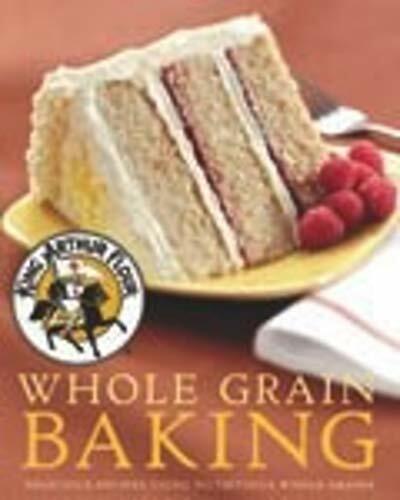 Do not use "whole wheat" or "whole grain" flour for this particular bread. Beyond the three cups or thirteen and a half ounces of flour, you will want to keep about a quarter cup for dusting the parchment paper and the tops of the loaves. Water should be pure so you should use bottled water or water you know to be pure such as home filtered water. If you use bottled water be sure it is from a vendor you trust to provide real filtered pure water and not tap water in a bottle. This could even be water from a home filter system. You are also going to use "rapid rise" yeast. The variety purchased at the store in single packets should be fine for this. However, if you suspect you are going to do a lot of bread baking I strongly suggest you buy it in bulk; it will be much cheaper that way. Unused yeast can be stored in a dark pantry, in the refrigerator in a sealed container, or even in the freezer. This recipe assumes that a serving is one small loaf (out of four) or about 250 calories. It is best to use a small mixer bowl for this sponge. Stir together the 1/4 teaspoon yeast and warm water. Let this stand for five minutes or until you get a creamy texture. In another bowl add the yeast mixture (above), the room temperature water, and flour. Stir for four minutes. Cover the bowl with plastic wrap to prevent contamination and let stand at room temperature at least 12 hours. You can also extend this time to one day if desired. In a small bowl stir together yeast and milk and let stand 5 minutes. This should give you a cream like texture. 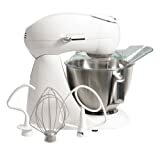 In the bowl of a stand-mixer blend together the milk mixture, sponge (from above), water, oil, and flour. Mix this at low speed with a dough hook until flour is just moistened. After a two minute wait, with the mixer off, knead the dough at medium speed for three to four minutes. Turn the mixer off and add the salt, then knead the dough for another four minutes more at medium speed. Scrape the dough from the mixer bowl into an oiled bowl and cover with plastic wrap. Let this dough rise at room temperature until doubled in bulk or for about one and a half hours. The dough will be very sticky and full of air bubbles. Prepare two baking sheets with two well-floured, 12- by 6-inch sheets of parchment paper. Turn the dough out onto a well-floured work surface and cut into fourths. Transfer each fourth to a parchment sheet and form into an irregular oval or rounded rectangle about 7 inches long. Dimple the loaves with floured finger tips and dust tops with flour. Cover the loaves with a dampened kitchen towel and let loaves rise at room temperature until almost doubled in bulk or for an hour and a half to two hours. Preheat oven, for ten minutes, to 425° F or 220° C.
Transfer two loaves on the parchment paper to one baking sheet and the other parchment with loaves to the second sheet. Bake the ciabatta loaves for twenty minutes, or until a pale golden color. Carefully transfer the loaves to a wire rack to cool. Allow the loaves to cool for ten to fifteen minutes. If using centigrade that internal temperature range is 96° to 100° C.
Bleached fours may contain residual chemicals, which is why I do not recommend using them. However, if you have no choice or just like bleached flour, use the higher temperatures recommended above. High heat is supposed to cook away any residual chemicals. This is another home-baked favorite. It's a great alternative to the traditional dinner roll and as mentioned above is a very good sandwich bread. Creating smaller or larger loaves is simply a matter of cutting the dough into the appropriate sizes prior to flour dusting and baking. A slight tangy "sour dough" flavor is created by allowing this dough to ferment for 12 or more hours. This is flavor is enhanced with the addition of olive oil in the dough. Though this is a very long process you may find the time required worth it the first time you taste your own home-baked ciabatta. Focaccia Bread Recipe - The Real Thing! Step-by-step video instructions of a focaccia bread recipe that will make you very happy. Handmade artisan bread with a beautiful crust - and so easy to make!